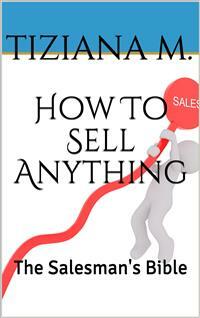 Opis ebooka How To Sell Anything - Tiziana M.
Opinie o ebooku How To Sell Anything - Tiziana M.
Fragment ebooka How To Sell Anything - Tiziana M.
The 7 Basic Requirements to Sell Anything toAnyoneYes, you read that right. If you are trying to sell anything to anyone, you canstreamline the whole process into just seven important requirements. If you usethem in the right amount and at the right time, you are certain to sell anything toanyone, probably even a refrigerator to an Eskimo! Requirement # 1 – Making the Right BackgroundSetting up for the sale is the most important. If you are able to pep your potentialcustomer up to their maximum, they won‟t be able to wait till they buy from you. Requirement # 2 – Making Your Product Seem ImportantPeople won’t buy things that aren’t important to them. So, you need to harp onyour product’s utility. Go all over town telling how undeniably useful yourproduct is, and a lot more people will be interested in it. Requirement # 3 – Making Yourself ImportantAll right, so your product is useful, but why should they buy from you? Why areyou better than the competition? You have to tell your customers that. You haveto tell them why you and your product are better for them than what thecompetitive market is selling. Requirement # 4 – Setting Off the AlarmsMake people understand that this is so great an offer that it won’t persist for long.